This is a technique I’ve been using with my mixed level high school classes recently. 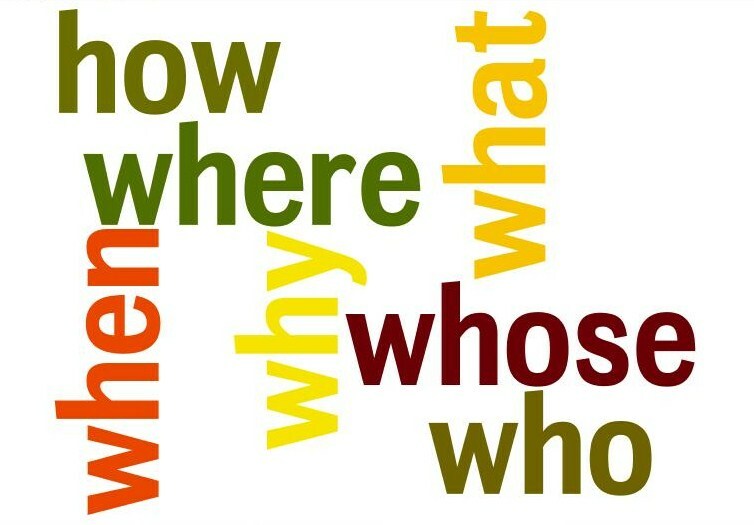 The aim is to generate ideas before writing a composition using question words as prompts. It’s very simple, very basic, but so far has been quite effective. This is how it worked the first time we did it. Describe one of your favourite pastimes. Explain why you like it and recommend it to others. First I asked the students to underline the three main verbs. I explained that these verbs would give them the backbone for their composition, each acting as a prompt for the three sections of their text. Then we brainstormed wh- question words and expressions we’d been looking at recently and I asked them to “question” the verbs. They didn’t get it to start with, but soon caught on with a bit of prompting. This is what we got after pooling all our questions. Describe: what? where? when? with who? how long? since when? Explain: why? how ( does it make you feel)? Recommend: where (the best place)? when (the best time)? with who? why? At home I looked at the rough drafts and typed them all up. I recast and reformulated the first drafts where necessary. And necessary for me meant either where the students had made slips that they could easily have avoided had they taken more care, or where they were pushing themselves beyond their comfort zone and experimenting. In both cases I was hoping that, with a little prompting, comparing their original with my reformulation would help them notice their mistakes, or the new language I was suggesting, but would also give a sound basis for redrafting and expanding on their initial piece of writing. I added a word count because we’d been looking at the exam marking criteria recently and they clearly state a minimum length of 120 words. All the first drafts were short, some by a long way. My main aim in this lesson was to show students how questions could help them expand on their original ideas and help them reach for the 120 word mark. And that’s why I added the questions under each text. The questions can be used in a number of ways, I guess. I had print outs of all the drafts, so I could have asked the students to go through all the texts and add an extra question to each. I could have asked them to work in pairs and answer the questions for each other’s texts based on what they already know about each other and educated guesses. I could have asked the students to add more questions for their own texts and then discuss this in pairs. I’m sure you can think of lots of other alternatives too. Whether it was a clean copy or a mess of scrawled writing, I didn’t care, it was definitely a question of process rather than product for me. I wanted them to see how questions could scaffold and prompt and hopefully take that experience into the exam with them to help them in the note-making stage. But of course, for those students who did write out a clean copy, the product was also something they were very interested in, and aware of that, we marked them together and gave them a mark out of 3 following the exam criteria. I don’t know if this will have any effect on their exam performance, but I hope at least it gave them an experience of success, and that in itself should help boost their confidence. 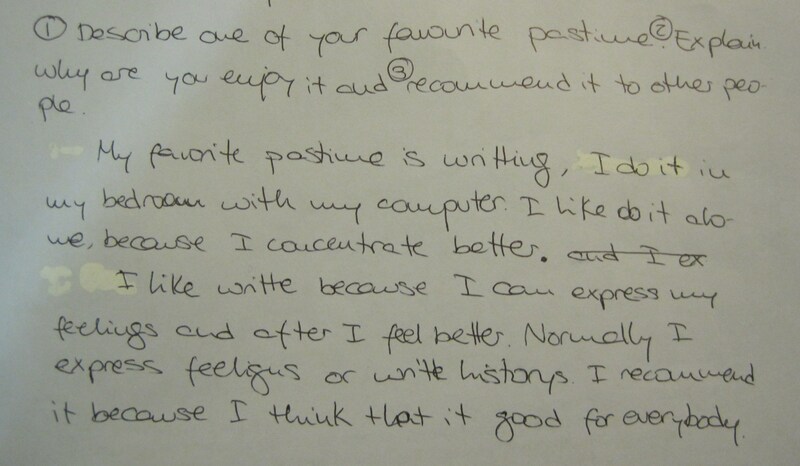 This entry was posted in thoughts on teaching and tagged lesson plan, mixed level, teaching teenagers, writing. Bookmark the permalink. This is wonderful! Thank you so much for sharing! I don’t teach writing at the moment, but hopefully I can adapt your strategies to my reading or speaking class. I really like the thought you put into making this beneficial for the students. It seems as though other than typing up their drafts you didn’t actually have too much prep work, and yet all that you did was super effective in the class. Nice! Thank you! Hi! Nice to see you here again. I’m glad you liked the idea. Here are a few ideas for using questions in reading and speaking classes. It’s great to have up your sleeve as a “plan B”! In the lesson previous to this one we used the same question word brainstorm as the starting point for a reading activity. he text we were reading was an interview. I first asked them to read to find out who the boys were and what they were doing. This was enough to get them going as the article was based on places they knew and kids the same age. I then asked them to underline five facts in the text. Then we brainstormed the question words on the board and I asked them to use them to write five questions. The questions were then used as comprehension questions for their classmates. I collected in the questions and typed them up (or some of them, there was a lot of repetition!) and used them at the beginning of the next lesson 1) for correction of common errors 2) to test their memories on the text. You can use them for speaking too by just writing a word on the board e.g. internet, writing up the questions and getting the students to write discussions questions. All with no (or very little) material to prepare, but if you collect in the questions, it gives you lots of material for the next lesson. Let me know if you try it out any time! Great lesson, Ceri. All student-generated, minimal equipment, space for individual creativity. I’m sure activities like this will build exam confidence. I teach exam writing frequently (mainly FCE) and teaching learners of English to produce a coherent relevant piece in 40 minutes is a daunting challenge. I’d appreciate it if you found time to blog other writing activities. By the way, how long did you take over it, and how many students? In this particular class there are 17 students. They’re 17-18 years old, in second year of Bachillerato. Very mixed level. We only have one hour a week together as a supplement to the mainstream classes, but within the mainstream timetable (hope that makes sense!) . This activity stretched over one and a half lessons I guess. Funny you should say that about other blog posts – I do happen to have another one brewing – about a lesson that never actually made the light of day – hoping to post it some time over the weekend.